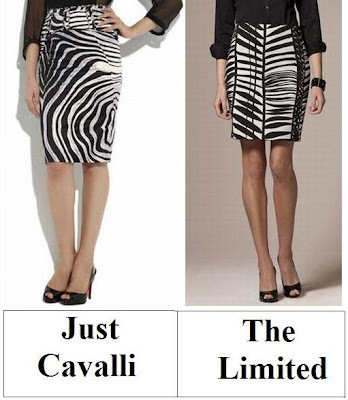 Hm, I like the pattern better on The Limited's, but like the longer length of the Cavalli. So I'm on the fashion fence with this one! I'm loving zebra print right now and these are both too cute! I'd definitely go for Limited version. Haha! I love your way with words! And yes, the Limited one is super cute. Ahh I adore the pattern on the Cavalli one, I don't think I could ever pull that print off but I'd sure love to! as usual i am going with the thrifty choice. cute skirt find! Will have to be a spendthrift on this one ~ that Cavalli skirt is just too amazing! Definitely the cheaper version for me... I love stretch fabrics and the length of the skirt is perfect. I like the limited one more! Have a wonderful day my Love! The Cavalli skirt is gorgeous! The length on the Cavalli amps up the sophistication factor. And to be honest, I'm also not thrilled about the seam coming down the front of the Limited number. Not all prints are created equal. Yes, ashley tisdale is a very famous and good actress! oh so pretty. I can hardly tell the difference, really. hi darling! i love that you stop by at my blog. im so thankful for it. this skirt is not really "me" but the skirt to the right looks better in my eyes. These are absolutely gorgeous! I tend to be skeptical of animal prints in such large doses, but that Cavalli skirt really may have changed my mind. On this one, I'd have to spend and go with Cavalli. I like the pattern more. Thanks! :) Feels great to end highschool. I'm actually really liking the Limited one. I wish I had a limited by me still. i really enjoy these posts of yours, Erika! This may be my favorite so far!!! I love the print and I love a good pencil skirt.... Hmmm... The Limited... I need to get my pencil shaped figure on over to a Limited pronto! $390 against $60... Ouch! But it doesn't matter, I need to be a big spender here. Mr Cavalli's is just too pretty. i think this time i prefer the cavalli version! the cavalli one looks so much better, so i'd have to put on my spendthrift cap... definitely! They're both so pretty. But I think I prefer the Limited's. Oo, I'm gonna have to go with the one from Just Cavalli. I love the silhouette. thrify for sure! i like the fact its a lil shorter and the pattern a lil better! 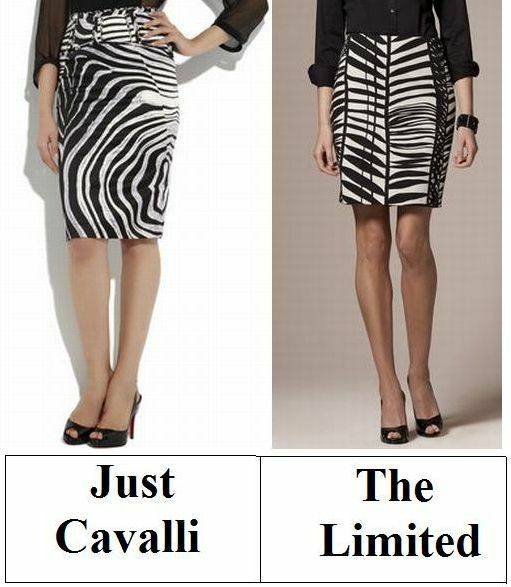 Bummer i prefer the Cavalli one, but the Limited is a great option! I like The Limited version like 80000x better!! That zebra print is amazing! but I think the panelling has totally won me over this time. lovely post as always dearest! Ooh I'll take the Limited one! The shorter hemline works for me, and there's something so much more appealing about that $59.50 price tag...! love both skirts... i wouldn't mind having one of each... ha! so cool. really a great find. Great post Erika, and surprisingly I prefer the more thriftier version of skirt to the Cavalli one. It's weird how it's like that sometimes, isn't it? but you definitely save a ton of money! I really like this Thrifted Thursday weekly feature, it's awesome! I like the Limited one better I think! Cheaping out is the way to go for me on this one, especially since it's Zebra and not too versatile- seems fun to just scrimp on it. I'll definitely be thrifty and go for the one from The Limited! Oh my, I LOVE zebra prints so much! Although I'd probably have to go thrifty on this one. These are so sassy and adorable! I actually like the pattern on The Limited one better... Though that's likely because I'm not very into animal prints. Cavalli is one of favorite designers - wonderful find, Erika!